Last month, Mrs. Meyer's Clean Day kicked off the holiday season with the launch of their new scent, Cranberry (available exclusively at Target) and my first introduction to their other holiday scents, Orange Clove and my new favorite this season, Iowa Pine. The fun night, hosted by the real Mrs. Meyer, was filled with festive cocktails and amazing food at Tasting Table at 495 Broome Street. Mrs. Meyer even served up some of her delicious, homemade English Toffee. Mrs. Meyer's Clean Day earth-friendly cleaning products, candles and variety sets are made from plant-derived ingredients and essential oils. Mrs. Meyer's Clean Day Season's Cleanings Set makes the perfect holiday gift, and includes a liquid hand soap, liquid dish soap & countertop spray in a festive box for $12.99. The seasonal scents are also available as a liquid hand soap ($3.99), countertop spray ($3.99), liquid dish soap ($3.99) and scented soy candle ($6.99). Items in the everyday collection are also the perfect size for stocking stuffers, like the room freshener ($4.99), daily bar soap ($3.99) and glass hand soap bottle ($9.99) in over a dozen scents. I can't wait to pickup some candles, hand soap, dish soap and dryer sheets in my favorite scents - Basil, Lavender and Rosemary. 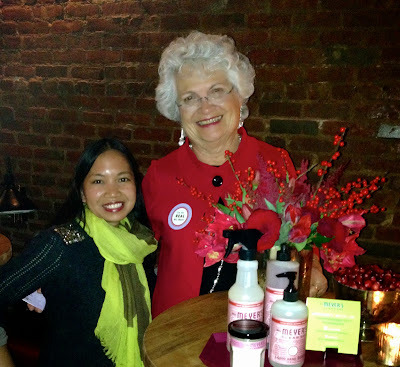 It was so nice to meet Mrs. Thelma Meyer and always a pleasure previewing Mrs. Meyer's Clean Day products!